It’s Paella night in our house this evening. 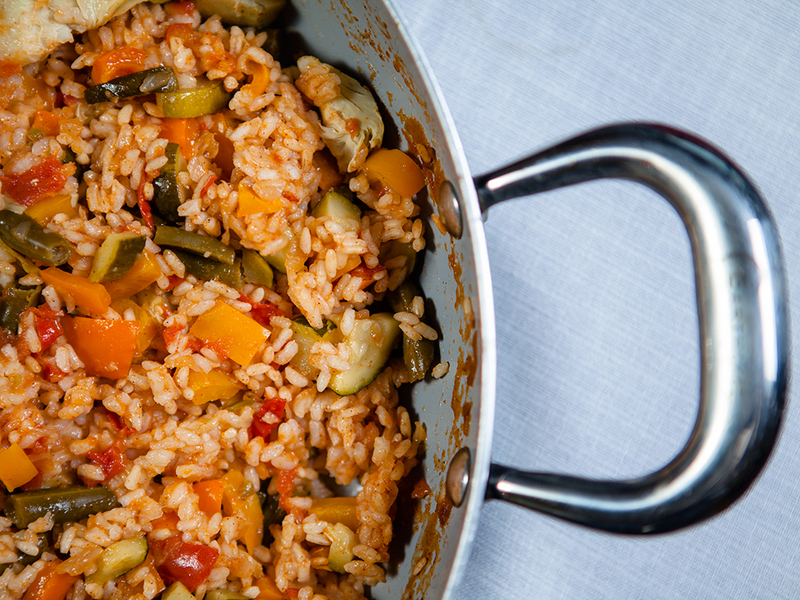 This traditional Spanish dish is probably a little different in every Spanish home, each recipe would have some family secret to it. 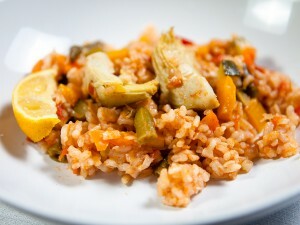 Paella usually has some kind of seafood and different meats in it. In our home it’s surprise ingredients are veggies lol. 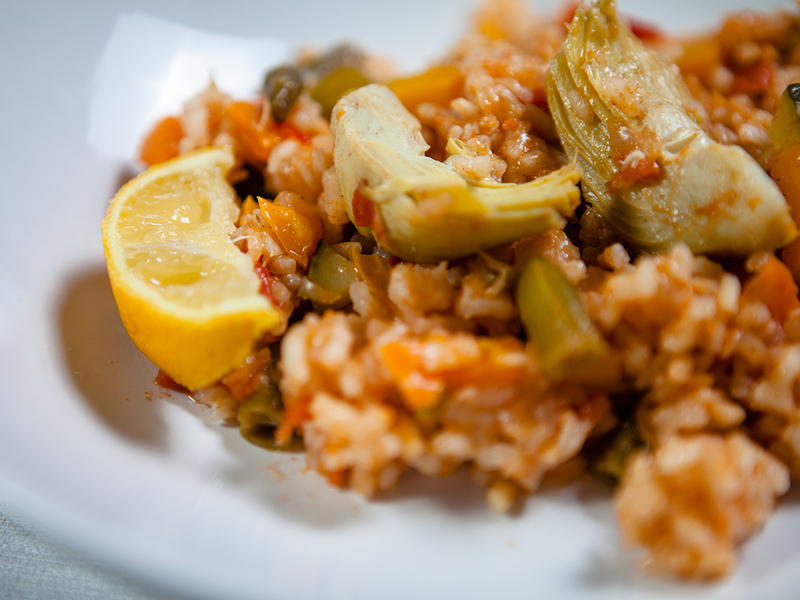 Yes its vegetable paella. Everywhere you read it says the best way to cook paella is in a paella pan known as a paellera. Its a large round metal pan with two handles. The design of the pan helps toast the rice on the bottom of the pan. I don’t have this traditional pan so I used a large skillet. I’ve never been to Spain but its definitely on my bucket list. I would have to brush up on my Spanish first though. In a large Paella Pan or heavy skillet over medium heat, heat the olive oil. Note: You will need a somewhat deep cooking dish that can go in oven as well as the range. Add onion and peppers and Chilli pepper stir to blend and cook 3 minutes or until slightly softened. Remove pan from heat. Stir in garlic and rice and continue stirring until garlic is fragrant and the rice is evenly coated with oil, about 1 minute. Stir in tomatoes, paprika, and salt. Stir in warm vegetable broth and saffron.Return to heat, reduce heat to low, and simmer (stirring and rotating the pan occasionally) mixture 10 to 15 minutes or until rice is no longer soupy but sufficient liquid remains to continue cooking the rice in the oven. Stir in artichokes hearts, and green beans and zucchini. Transfer pan to the oven and cook, uncovered, about 20 minutes until the rice is almost al dente and until almost all liquid is absorbed. NOTE: Remove from the oven when the rice grains are no longer hard but still have more bite than you want and a crust forms around the edge of the pan. 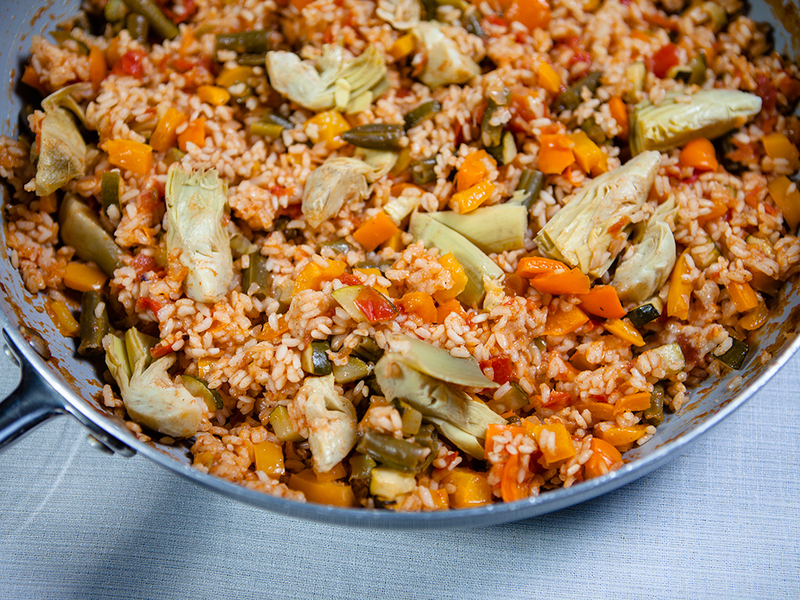 Remove from oven, cover with aluminum foil, and let sit for 10 minutes or until the rice is cooked to taste.Paella must rest after being removed from the oven, during which time the final cooking takes place. For some delicious treats try these Coconut Cranberry Bars Vegan, Gluten we had yesterday.